John Edward Musker (born November 8, 1953) is an American animation director. Along with Ron Clements, he makes up the duo of one of the Disney animation studio's leading director teams. Musker was born in Chicago, Illinois, the second oldest of eight children in an Irish Catholic family. His father, Robert J. Musker, who worked for over 40 years at Illinois Bell Telephone, died in 2008 at the age of 84, and his mother, Joan T. Musker (née Lally), died in 2011 at the age of 81. He attended Loyola Academy in Illinois and then graduated from the Weinberg College of Arts and Sciences at Northwestern University, where he majored in English and drew cartoons for the Daily Northwestern. Musker met Ron Clements during the production of The Fox and the Hound in 1981, where he worked as a character animator under Clements and Cliff Nordberg. Musker teamed up with Clements as story artists on The Black Cauldron before they were removed from the project. Following the green-lighting of Clements's pitch for an adaptation of the children's book series Basil of Baker Street by Eve Titus into an animated feature, Musker and fellow story artist Burny Mattinson were assigned as the original directors while Dave Michener was brought in as an additional director. Due to a shortened production schedule and multiple story rewrites, Roy E. Disney assigned Mattinson to serve as director/producer while Ron Clements was brought in as another director. While working on The Great Mouse Detective, newly appointed Disney CEO and chairman Michael Eisner and Jeffrey Katzenberg issued invitations to the animation staff for their first held "gong show" session. Demanding only five new ideas, Clements pitched an adaptation of Hans Christian Andersen's The Little Mermaid and a high-concept idea of Treasure Island in Space, which were both rejected by Katzenberg and Eisner. The next morning, Katzenberg approached Clements and asked him to expand his initial treatment. With The Little Mermaid in production in 1986, Musker joined Clements in expanding the original treatment into a twenty-page rough script, eliminating the role of the mermaid's grandmother and expanding the roles of the Merman King and the sea witch, and were later joined by Off-Broadway musical composers Howard Ashman and Alan Menken who collaborated on the song and musical score. Released in November 1989, The Little Mermaid was praised as a milestone in rebirth of Disney animation by film critics and collected a domestic gross of $84 million, cumulatively receiving $184.2 million worldwide. When work on The Little Mermaid was wrapped, Clements and Musker re-developed their idea for Treasure Planet, but the studio still expressed disinterest. Instead, the two directors were offered three projects in development: Swan Lake, King of the Jungle, and Aladdin. The directors eventually chose the latter, desiring a wacky, faster-paced, and more contemporary mood separate from the previous Disney animated films. Working from Ashman and Menken's treatment and musical score, the two delivered a story reel to Katzenberg in April 1991, which was strongly disapproved of. Jettisoning multiple characters and story ideas and the inclusion of Ted Elliott and Terry Rossio as co-screenwriters, the production team restructured the entire story in eight days. Released in November 1992, Aladdin received positive reviews from film critics, and became the first animated film to gross over $200 million in domestic grosses. Following work on Aladdin, Clements, along with Musker, resumed their work on Treasure Planet, which was again turned down by Katzenberg in 1993 who disapproved the adaptation of a classic adventure tale and setting it in outer space. A deal was struck with the two directors to create another commercial film before he would approve Treasure Planet. Rejecting projects in development such as Don Quixote, The Odyssey, and Around the World in Eighty Days, they were later informed of animator Joe Haidar's pitch for a Hercules feature, and signed onto the project. During production on Hercules, in 1995, Clements and Musker signed a seven-year contract deal with the studio which stipulated following Hercules, the studio would produce Treasure Planet or another project of their choosing. With Treasure Planet completed in 2002, Clements and Musker later inherited Fraidy Cat, which was originally a project developed by Dutch animation director Piet Kroon. Fraidy Cat, however, never saw its light of day, as David Stainton, then-president of Walt Disney Feature Animation, refused to green-light the project. It was soon followed with Clements and Musker's resignation from Walt Disney Feature Animation in September 2005. When John Lasseter was appointed chief creative officer over Walt Disney Feature Animation in February 2006, he invited Clements and Musker back to Disney to oversee production on The Frog Princess, and were officially confirmed as directors in the following July. Later re-titled The Princess and the Frog, the film received positive reviews and grossed $267 million worldwide. After directing The Princess and the Frog, Clements and Musker started working on an adaptation of Terry Pratchett's Mort, but obtaining the film rights prevented them from continuing with the project. To avoid similar problems, they pitched three new ideas, where by 2011, the two directors started developing the film based on an original idea. In late 2012, the duo announced that they will be directing a new film in the future, but they have their lips sealed for the title, the plot, and the animation style. In July 2013, it was revealed that the film, titled Moana, would be "a Polynesian tale involving the island folk and the idols made famous the world over". On November 10, 2014, Disney confirmed Moana would be released on November 23, 2016. In March 2018, having worked there for 40 years at Disney, Musker announced his retirement from Walt Disney Animation Studios. He is currently animating his own original short film by hand. Musker is married to Gale. They have twins sons, Jackson and Patrick, and daughter, Julia. He also has a sister by the name of Pat. John Musker and Ron Clements have cast certain actors in more than one of their films. ^ a b "Joan Musker Obituary". Chicago Sun-Times.com. February 15, 2011. Retrieved March 21, 2015. ^ a b "Death Notice: ROBERT J. MUSKER". Chicago Tribune. November 24, 2008. Retrieved March 21, 2015. ^ Deneen, Nancy (2008). "The Animated Life of John Musker, Class of 1975". Weinberg College of Arts & Sciences. Retrieved October 30, 2013. ^ Wells, Paul (2002-01-01). Animation and America. Edinburgh University Press. ISBN 9781853312038. ^ Thomas 1997, p. 117. ^ Korkis, Jim (February 23, 2011). "How Basil Saved Disney Feature Animation: Part One". USA Today. Archived from the original on July 12, 2014. Retrieved December 28, 2015. ^ Stewart 2005, p. 95. ^ Treasures Untold: The Making of Disney's "The Little Mermaid" (Documentary film). The Little Mermaid: Platinum Edition DVD: Walt Disney Home Entertainment. 2006. ^ Thomas 1997, p. 120. ^ "1989 Worldwide Grosses". Box Office Mojo. Retrieved December 28, 2015. ^ Verrier, Richard; Eller, Claudia (December 6, 2002). "Disney's 'Treasure Planet' an Adventure in Losing Money". Los Angeles Times. Retrieved December 28, 2015. ^ Ron Clements; John Musker (October 13, 2015). "Everything you ever wanted to know about Aladdin" (Interview). Interviewed by Josh Labrecque. Retrieved December 28, 2015. ^ a b Rhodes, Joe (November 8, 1992). "COVER STORY : What Would Walt Say? : The credits read Disney, but 'Aladdin' is a brand-new 'toon, an irreverent high-stakes gamble that veers sharply from tradition". Los Angeles Times. Retrieved December 28, 2015. ^ John Musker, Ron Clements, Eric Goldberg, Amy Pell, Ed Gombert, Terry Rossio, Ted Elliot (2004). Reflections On Black Friday (DVD). Aladdin: Platinum Edition: Walt Disney Home Video. ^ Fox, David J. (April 21, 1993). "'Aladdin' Becomes a $200-Million Genie for Disney". Los Angeles Times. Retrieved December 28, 2015. ^ a b Verrier, Richard; Eller, Claudia (December 10, 2002). "'Treasure Planet': A Disney dud in the making for a long time". Retrieved December 28, 2015. ^ "Who the hell do we get to play Hades?". Jim Hill Media. April 5, 2001. Retrieved December 28, 2015. ^ "Bad day in the barnyard". Los Angeles Times. April 5, 2004. Retrieved December 28, 2015. ^ Hill, Jim (August 17, 2005). "Why was the head of WDFA afraid to put "Fraidy Cat" into production?". Jim Hill Media. Retrieved December 28, 2015. ^ Sito, Tom (March 14, 2006). "The Late, Great, 2D Animation Renaissance — Part 2". Animation World Network. Retrieved December 28, 2015. ^ Ron Clements; John Musker (March 11, 2010). "An Interview with John Musker and Ron Clements". DVD Dizzy (Interview). Interviewed by Luke Bannano. Retrieved December 28, 2015. ^ "Comic-Con Sees Stars, 2D Officially Back at Disney". Animation World Network. July 23, 2006. Retrieved December 28, 2015. ^ "The Princess and the Frog (2009) – Box Office Mojo". Box Office Mojo. IMDb. Retrieved December 28, 2015. ^ Connelly, Brendon (April 6, 2013). "What Disney's Film Of Terry Pratchett's Mort Might Have Looked Like... And A Preview Of Things To Come". Bleeding Cool. Retrieved December 28, 2015. ^ a b Miller, Bruce (August 24, 2013). "Sioux City native Ron Clements preps new film for Disney studio". Sioux City Journal. Retrieved December 28, 2015. ^ a b Jardine, William (July 11, 2013). "Tonnes of New Details Revealed About Disney's Upcoming Slate!". Big Screen Animation. Retrieved July 11, 2013. ^ Lang, Brent (November 10, 2014). "Disney Animation's 'Zootopia,' 'Moana' Hitting Theaters in 2016". Variety. Retrieved December 28, 2015. ^ Amidi, Amid (March 19, 2018). "John Musker, Co-Director Of 'Aladdin' And 'Moana,' Retires From Disney After 40 Years". Cartoon Brew. Retrieved March 19, 2018. ^ a b Dinello, Dan (June 15, 1997). "John Musker Brings Chicago Sensibility, Madcap Style To Disney". Chicago Tribune. Archived from the original on March 20, 2016. Retrieved March 20, 2015. Thomas, Bob (March 7, 1997). Disney's Art of Animation: From Mickey Mouse To Hercules. Disney Editions. ISBN 978-0786862412. 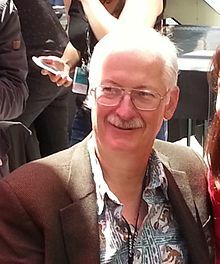 Wikimedia Commons has media related to John Musker.